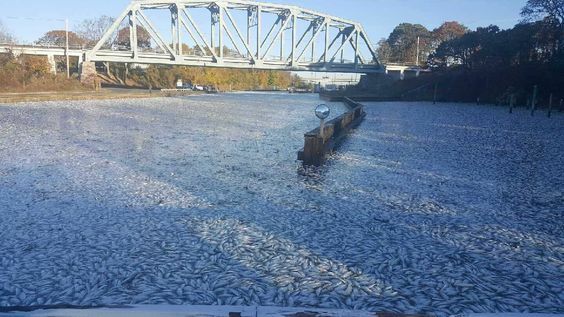 Outside Hampton Bays in upstate New York residents were shocked this week to find tens of thousands of dead bunker fish in the Shinnecock Canal. The fish are believed to have packed so tightly into the canal to escape hungry predators that they depleted the oxygen. Such die-offs are known to happen, but locals in the area say they haven’t seen anything like it. The state Department of Environmental Conservation is investigating the cause, but residents believe the fish were corralled trying to escape a big school of blue fish in the bay earlier on Sunday, reports CBS New York. Many residents could not believe what they were seeing. Others thought it looked like ice on the water. When officials opened the locks to the canal, many thousands of fish flushed out into the beach where they remained. Fishermen in the area say they plan to use the fish as bait for crab and lobster. The birds don’t have it too bad either. “I actually talked to a couple of DEC officer who said they’ve never seen it this bad before,” boat captain Dennis DeMarco said.